Everyone knows that carrots are good for you, but did you know that they may be a good ingredient to have in skincare? Neither did I, so I wanted to put it to the test with the Discovery Set from Dr Renaud's Carrot Radiance range. This is a creamy manual exfoliator that combines two scrubby elements, finely ground bamboo powder and tiny jojoba beads, to give your skin a gentle but effective polish. It has a light fresh scent and has added kaolin clay to help draw out impurities. It felt a little drying afterwards which I would say is associated by the clay being included in the formula, but it works very well and leaves skin looking brighter and clearer after a couple of applications. Recently re-formulated, this AM moisturiser utilises the beta-carotene and vitamins in Organic Carrot extracts to help brighten the skin and strengthen it against free radicals. It feels light in texture, absorbs into the skin quickly and keeps it feeling soft and hydrated throughout the day, but I didn't see any difference to my complexion after using up this small sample. It may need longer term use before you start to see the real benefits perhaps? Slightly thicker in texture to the Day Cream, the Renewing Night Cream takes longer to sink in and would be suitable to use as an overnight treatment. I have the same feelings as the Day Cream though; whilst the two seemed to work well together, I didn't notice any big differences. My skin felt more plumped up and hydrated which I liked, but I couldn't see any changes to my complexion looking brighter. Again, you may get better results with long term use though so do bear that in mind. 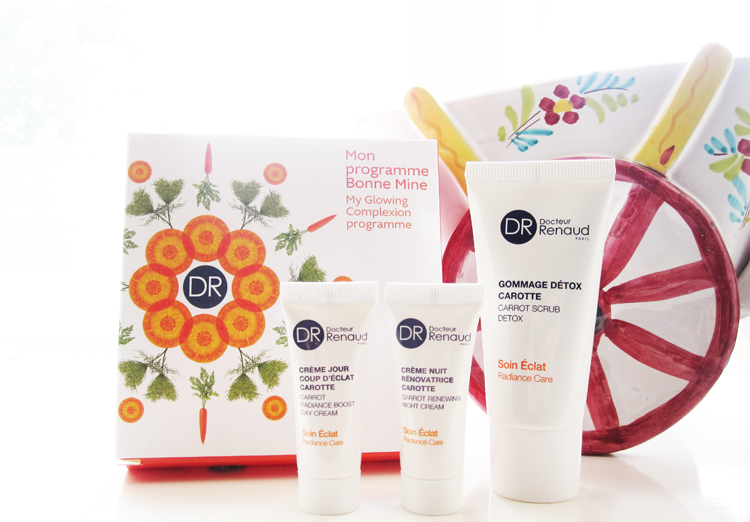 Dr Renaud Carrot Radiance Discovery Set* and the full range of products are available from Dr Renaud here. Have you tried any of the skincare ranges from Dr Renaud?